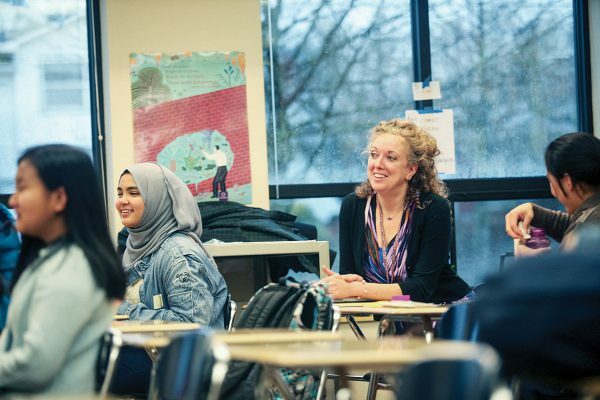 On a normal day at Corvallis High School, Mary Skillings' English Language Learner students spend the first few minutes of class chatting in the way bubbly teenagers do. But Nov. 9, 2016, was no normal day. It was, instead, the day after the presidential election, and Donald Trump, whose campaign had promised among other offerings a border wall, a Muslim registry and the deportation of millions of illegal immigrants, had won the Electoral College vote, making him the 45th president-elect of the United States. Needless to say, Skillings' classroom that morning had a much different tone than usual. On that same morning, Vincent Adams, a member of the Corvallis School District board, was taking his daughter to school. He, too, noticed a big difference in the tone of the day. An hour away in Eugene, two Latina students were in tears at Jennifer Scurlock’s desk at Churchill High School. Across the state and around the country, similar scenes played out as students, families and educators grappled with how a Trump presidency would impact their lives. The anxiety, which had been on the rise throughout the entire presidential campaign, was even more immediate for minority and immigrant students and families, some of whom may not have been living in the country with the proper documentation. Many feared they or their families might be deported; that they might never see their loved ones again. That fear and trepidation, however, has riled up a response - from local education associations, to school districts, to citites and beyond. Educators have rallied to have their districts pass resolutions declaring them sanctuary districts — places where students and families can feel safe, where schools don’t track immigration status or share private information with federal agents, and where teachers and students can do what they’re there to do: teach, learn and treat every one with the respect they deeply deserve. 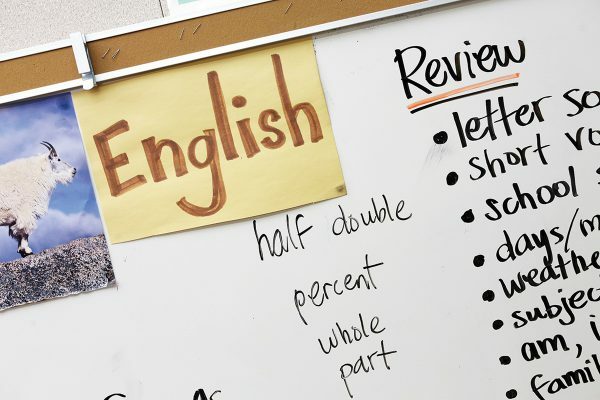 “We are just going to become the safe people that students know they can go to, that they can count on," says Mary Skillings, ESL teacher at Corvallis High School. According to the Pew Research Center, there were more than 11 million “unauthorized immigrants” living in the United States in 2014. Oregon was home to an estimated 130,000 of those immigrants, which includes families whose children attend public schools across the state. Since 1987, undocumented immigrants here have had some level of protection from being apprehended or deported by state or local police solely on the basis of their immigration status. ORS 181.850 is current state law that bars the use of any state or local resources for immigration matters when the only violation is being an undocumented immigrant. Cities around Oregon have also passed resolutions or policies at the local level aimed at reinforcing sanctuary measures, including that local law enforcement won’t actively cooperate with federal immigration agents to help identify and deport undocumented immigrants. Colleges and universities around the state, from the University of Oregon and Oregon State to Portland State University, have also declared sanctuary status. The designation doesn’t necessarily have full legal support, as jurisdictions that have enacted such resolutions must still comply with federal law. Even so, officials, often backed by public support, implement sanctuary status as a gesture to let undocumented immigrants know that they may find a measure of safety and be assured that they won’t be detained simply for being undocumented. During the first week of February, Oregon Governor Kate Brown issued an Executive Order that forbids all state agencies and employees from helping federal immigration officials locate or apprehend undocumented immigrants. According to an Oregonian article, the Governor’s executive order takes state law one step further, by expanding the state’s sanctuary status to all agencies and making it illegal to discriminate based on immigration status. "We will not retreat," Governor Brown said in the article. Skillings says there has been an underlying current of unease in her classroom since Trump took office. Scurlock, the high school English teacher in Eugene, said she started to notice a change in the atmosphere around school toward the end of last school year, just as the presidential campaign was shifting into high gear. The change manifested in the frequency that students of color were being harassed by others. Devin Hunter, president of Hillsboro Classified United, the classified employees union, said there’s been plenty of talk about a rise in xenophobia and anti-immigrant sentiment in Hillsboro schools, as well. Last spring, a few hundred students at Hillsboro High School staged a walkout to show support for their peers at Forest Grove High School, who had walked out to protest a racist banner that had been put up by a student (and then quickly removed) at their school. “We have a huge migrant community here, so there is a lot of interest,” Hunter said. “I think there’s a lot of fear about where our nation is going. That fear prompted one family in Hillsboro to take drastic action, according to Golay. She said the family was so concerned about being deported after Trump’s election that, rather than await deportation, they made arrangements for their eighth-grade son to stay in Hillsboro with a family friend and they returned to Mexico. Fear of deportation ticked up almost instantly on election night, as soon as it became clear that Trump was going to garner the Electoral College votes he needed to win. Since that day, sanctuary status designations have soared to the top of the priority list for many jurisdictions, including the city of Portland. Within a week of the election, new Portland Mayor Ted Wheeler had reaffirmed the city’s commitment to sanctuary, as had the state’s three major colleges, UO, OSU and PSU. Eight days after the election, the Portland Public Schools (PPS) board voted unanimously on Nov. 16 to adopt a sanctuary resolution that protected undocumented students, while also laying out guidelines for how federal Immigration Control Enforcement officers can conduct activity at schools throughout the district. Specifically, Portland’s resolution requires federal agents to contact the superintendent and general counsel in person before entering school property; they also have to provide written notice and a reason for why they need to go into the building. The resolution also notes that school staff are not to inquire about students’ immigration status, nor are they permitted to share the immigration status of students, something already in place under the federal Family Educational Rights and Privacy Act. The actions of Portland Public Schools are part of what inspired other districts to take up the issue, as well. By early December, the Hillsboro Education Association (HEA) and Hillsboro Classified United (HCU) had drafted a letter to the chair of the school board requesting a meeting to consider a resolution similar to the one passed by PPS. As of late January, that meeting had yet to happen, but Golay and Hunter said the response had been positive and an informational meeting would likely occur with the board and the superintendent. An alternative term used to describe sanctuary status is the Safe Zone, which is another way to help districts address student fear about immigration enforcement under the Trump administration. Safe Zone and sanctuary resolutions can contain reassurances for students, procedures for law enforcement, and information for families and staff. But how to go about getting the board in your district to adopt one? The National Education Association’s EDJustice has compiled a helpful FAQ sheet, including a sample resolution, that makes it fairly easy for anyone interested to bring the idea to their school board. The informational sheet explains how to present the resolution to the board and how a Safe Zone works in regard to law enforcement. Find out more at www.neaedjustice.org. “I think they just have some more questions about how it would impact the district, whether we’re not already doing some of this, how it might change,” Golay said. The process was fairly similar in Eugene, with members of the Eugene Education Association passing their own resolution and then working to have it considered by the school board. The board did take up a resolution in January, but it was one that leaned more toward reaffirming the policies it already has in place. Members planned to vote on that resolution in mid February. As in Portland, the school board in Corvallis made quick work of its resolution, adopting it the same night it was introduced in December. Adams, the school board member there, said it was an important step to take, especially considering the demographics of the area. The district itself is 14 percent Latino, and thanks in part to the presence of OSU, more than 50 languages are spoken in the district, the top three being English, Spanish and Arabic. Scenes from inside Mary Skillings' ESL classroom. On the night the Corvallis School Board adopted its resolution, Adams said one parent stood up to voice an opposing view, that perhaps the school board was simply responding to the political climate of the time. Adams said he took that into consideration, but also gave himself a test. If the issue had come up three years ago or at some other time during the Obama administration, would he have supported it? Others who have questioned the need for adopting sanctuary resolutions wonder whether they are really necessary or if the current state and federal laws are enough. Golay said some in Hillsboro wondered if it was just being done as an “image thing” or if there really is some substance behind the sanctuary status — and a need for it. Although the sanctuary resolutions that have been adopted or are under consideration do overlap with existing state and federal regulations already in place, they do define policies more clearly and, in some cases, beef up what’s there. For example, resolutions adopted in Portland and Corvallis not only lay out what educators there are supposed to do if ICE officials need to come into a school, but they also directed the districts to provide training for teachers and staff on how to interact with and respond to agents, should the situation arise. If that were to happen, teachers and staff would follow the steps outlined in the resolutions while also not sharing immigration status information. Since the election, Trump has continued to make good on some of his campaign promises, including issuing Executive Orders related to the southern border wall and immigration. The latter order, signed in January, banned immigration from seven predominantly Muslim countries. While that one doesn’t technically impact folks living in the U.S., it does echo the administration’s larger take on immigration and hints at what might be in store for the future. Continued talk of the wall, too, has done little to ease anxiety. Compounding the sanctuary issue was yet another Executive Order from Trump in January that threatened to strip federal funding from sanctuary cities if they don’t comply with federal immigration authorities. There are concerns that, if the order stands — the city of San Francisco promptly sued Trump over it at the end of January — it might imperil federal funding at the school district level, as well. Adams said he has had several conversations on the matter with colleagues in the Corvallis School District, and while he acknowledged the potential impact, he said it seemed like a long shot — and one that is worth rolling the dice on. “The risk is there, but the way schools get federal funds is that it goes through the state and it’s distributed through the Oregon Department of Education,” he said. He notes that the bulk of Title I federal dollars support special education programs and students in poverty. It could be a perilous decision, politically, to pull Title I money from a district. “See how that flies,” he cautions. As with seemingly everything under the new administration, educators must take a wait-and-see approach when it comes to sanctuary status. Though some have already adopted resolutions, how they will hold up in the wake of Trump’s future actions remains to be seen. Other districts that are still working on their own versions and policies may find that they will continue to evolve or need further tweaking based on what comes out of the White House. In the meantime, however, daily life goes on in public schools across Oregon. Politicians may be issuing orders and making threats to build walls, ban travel and strip funding, but students have concerns that are much more immediate to them in their own lives. After the election, Skillings said one student from Vietnam raised her hand to voice her concerns about what, broadly, might happen. Still, Skillings doesn’t deny that there is an underlying current of unease coursing through the days. Her hope is that schools in Oregon, and the people who work in them with students every day, can help ease that. Taking the sanctuary approach will likely be a big part of that. Scurlock said she realized as much the day after the election, when her students were in tears.